Files & Photos is where you can add any documents or worksite pictures that you'll need to add to your reports. You can reach this section on the top menu. Once there you'll be able to see any files that have already been uploaded to your daily reports. The file location listed near the top of the page is also accessible by using the Files tool. By clicking the Create Folder button an additional folder will be created for further organizing your Daily Reports. A small window will appear for you to name that folder. Permissions on that file will determine who can view it both in Daily Reports and the Files tool. 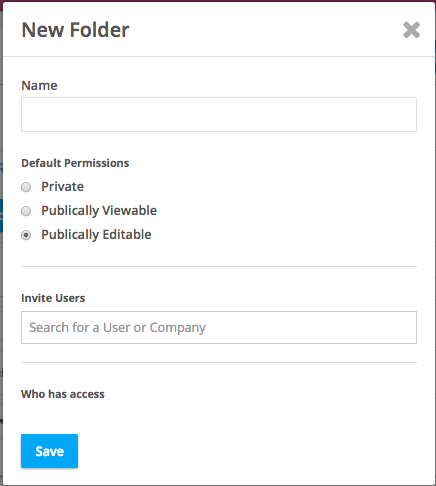 Inviting Users will make it so that regardless of any setting placed, they will be able to view the folder. The Upload button lets you take files form your computer and add them to the Daily Report. 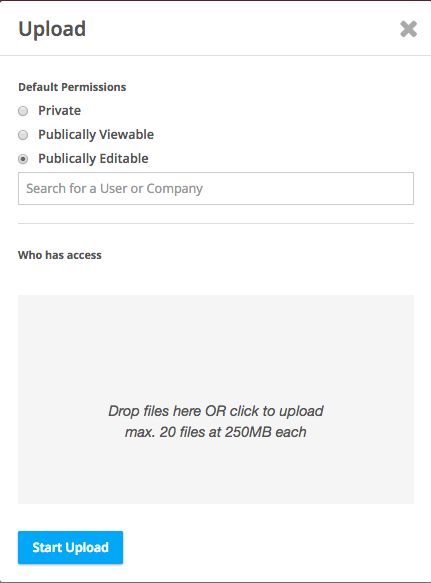 The Upload window has a few options to alter the permissions of that document. Selecting Private will make it so that you will be the only one to see that file. Publicly Viewable allows anyone to view the file, but they're unable to edit or remove it. Publicly editable lets all users edit, view, or destroy that particular file. When you're ready to select your files, you can either drag them to the grey box stating Drop files here or click the box to open your file browser. Once they're uploaded, clicking Start Upload will add the files to the Daily Report. Copy From allows you to choose files or whole folders to copy into the Daily Report. When the window appears all you need is to navigate to the file or folder you want, select it and click Save. That folder will then be placed into the folder for that Daily Report. If you have any issues with this feature or if you need any more info feel free to contact us at support@buildingblok.com or call us at 800-708-2565. We'll be glad to help!